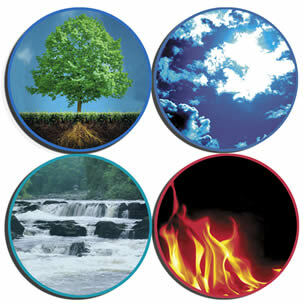 These are the four basic elements of matter as seen in ancient Greek, Hindu and other traditions. Each had different names for them, but the concepts were similar. And in recent days, Japan has been experiencing multiple disasters involving all these elements. It started with the 9.0-magnitude megathrust earthquake off the coast of Japan that occurred at 2.46 pm Japan time on 11 March 2011. Its epicentre was 130 kilometres off the east coast of the Oshika Peninsula of Tohoku, near Sendai. The earthquake triggered highly destructive tsunami waves of up to 10 meters (33 ft) that struck nearby coastal areas minutes after the quake, and in some cases travelled up to 10 km (6 miles) inland. The earthquake and tsunami waves killed over 5,000 people, caused massive property damage and started fires in some affected locations. Most worrying was the damage caused to the Fukushima II nuclear power plant where reactors damaged by the quake and tsunami led to an accidental leak of radioactivity. Japan has a long history of living and coping with disasters, but the magnitude and confluence of multiple disasters has plunged the country into the worst crisis since the Second World War. This week’s Wiz Quiz devotes several questions to the history and science of tsunamis.